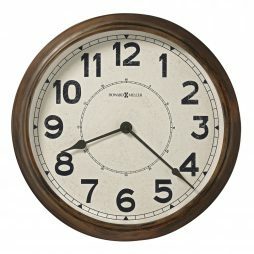 This stately wall clock dial is inspired by the time-honored, simple design of a fashionable wrist-watch. 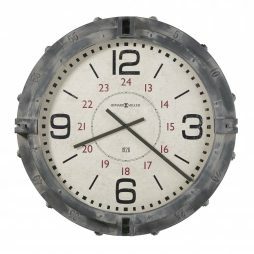 A 19″ diameter circular spun silver-finished metal case frames the circular spun titanium finished dial which has applied, satin silver-finished bar style hour markers. 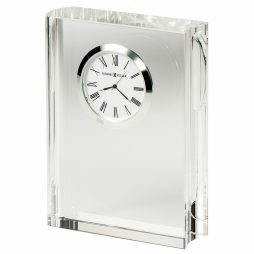 Satin silver-tone hour and minute hands feature white centers and are protected by a glass crystal. 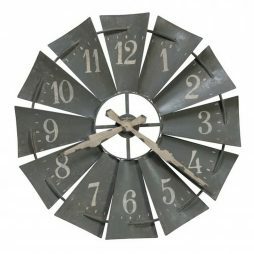 This striking, industrial metal mantel clock features a bent iron tambour frame with an aged silver finish. 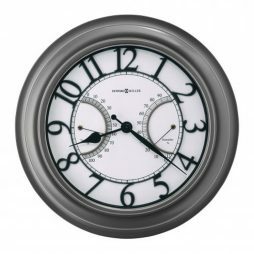 Blackened, machined steel dial with contrasting aged silver-finished hour and minute hands. 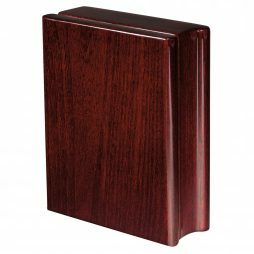 Felt pads protect your mantel or tabletop. 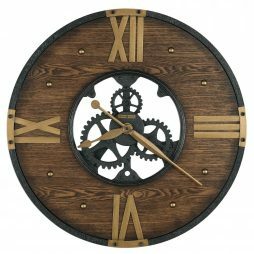 This fresh 29.25″ diameter cast aluminum wall clock features a polished finish with Roman numerals and decorative metal gears in the center of the dial. 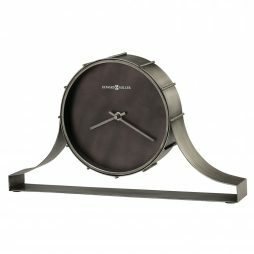 Contrasting spade hour and minute hands finished in charcoal gray complete the look. 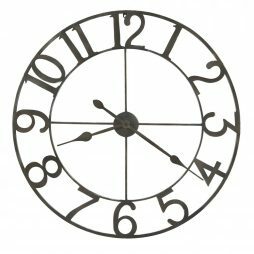 An aged dial features worn black Arabic numerals and minute track and charcoal finished hour and minute hands. 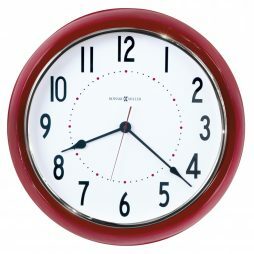 Quartz, battery-operated single-chime movement plays Westminster chimes on the hour and counts the hour. 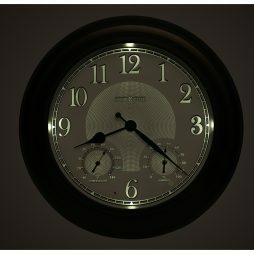 Automatic nighttime chime shut-off. 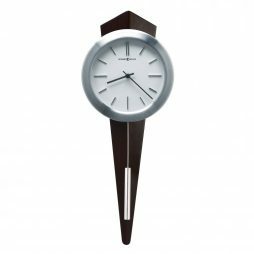 This contemporary wall clock features an elongated diamond shaped case finished in Black Coffee on select hardwoods and veneers. 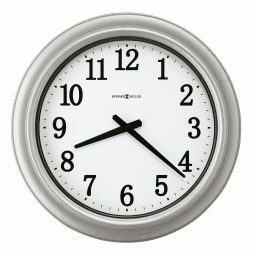 A bold, circular brushed, silver-tone finished metal bezel surrounds the crisp white dial with applied polished chrome finished bar style hour markers and silver-tone hour and minute hands behind a convex glass crystal. A stylish pendulum with a spun silver-finished cylindrical bob with a round stick hangs below. 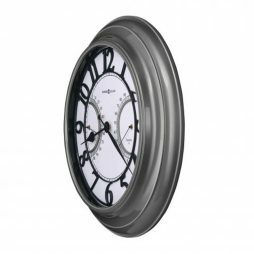 This charismatic 24.25″ diameter metal wall clock is 3.25″ deep and features a medium charcoal finish. 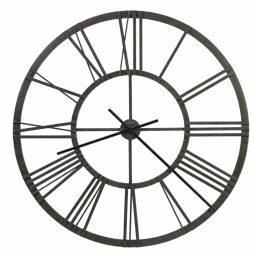 The white dial is highlighted by raised, black Arabic numerals and black spade hour and minute hands. 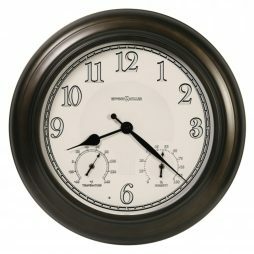 Raised, medium charcoal semi-circles accent the included thermometer for temperature and hygrometer for humidity. 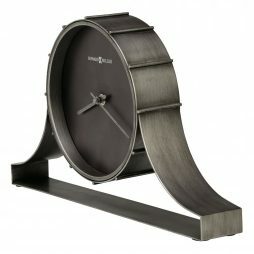 This sophisticated wall clock dial is inspired by the time-honored, sleek design of a formal wrist-watch. 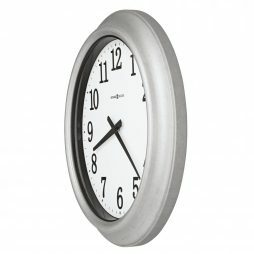 A 16″ diameter circular spun silver-finished metal case frames the circular spun satin silver finished dial which has applied, satin silver-finished, tapered bar style hour markers and a bright silver-finished inner ring with black minute track. 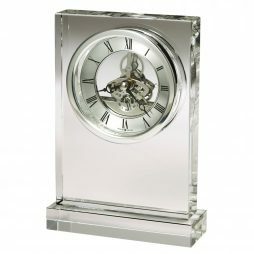 Black hour and minute hands and silver-finished seconds hand are protected by a glass crystal. 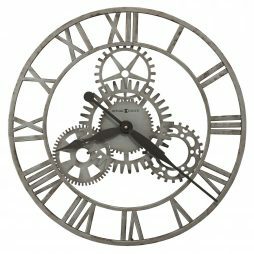 This 20″ diameter wrought iron wall clock features applied Roman numerals and fixed center gears finished in antique silver and contrasting hour and minute hands finished in rusty brown for an aged look. 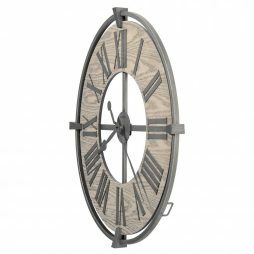 This large 34″ diameter windmill style metal wall clock features an antique brownish charcoal finish and significantly aged white hour and minute hands for an aged look. 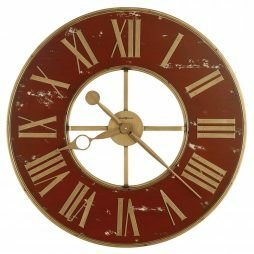 Aged white Arabic numerals and minute track decorate the fixed windmill blades. 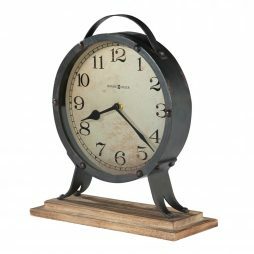 This striking, industrial metal mantel clock features a deep, round bent iron frame with an aged silver finish. 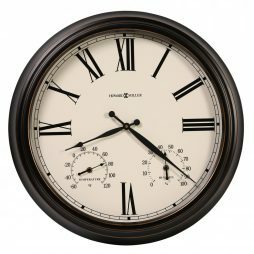 The dial features wrought-iron Roman numeral and bar hour markers that are suspended in front a machined steel background. 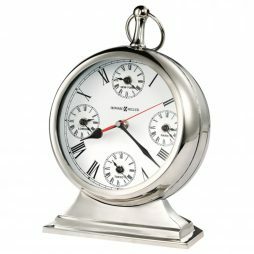 Contrasting aged silver-finished hour and minute hands complete the look. 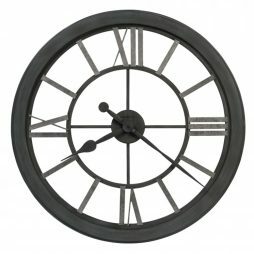 This dramatic 49″ diameter wrought iron wall clock features heavy metal applied Roman numerals and is finished in charcoal gray with silver highlights on the edges. 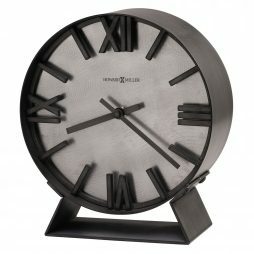 Matching hour and minute hands with charcoal gray finish and silver highlights on the edges complete the look. 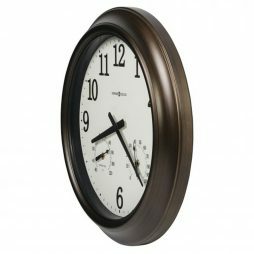 This inviting 22″ diameter metal wall clock is 3.25″ deep and features a worn black finish with gold rub through on the edges. 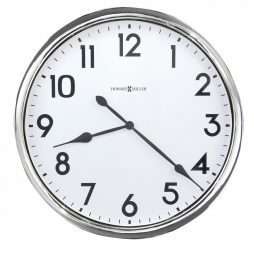 The off-white dial is highlighted by easy to read black Roman numerals, a thermometer for temperature, a hygrometer for humidity, and black hour and minute hand. 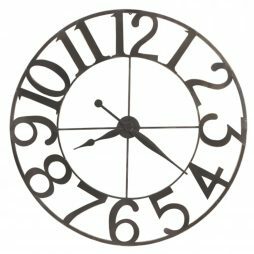 Businesses come and go all the time, depending on high and low demands of certain products on the market at any given time. However, many of the companies that have managed to become successful and stay afloat generally have a quality in common: they were family businesses. Multi-generational hard work and determination have kept dreams alive through good economic times and bad. 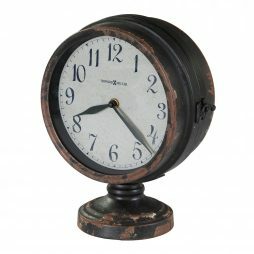 The same can be said for the Howard Miller Company, a clock-making business which has thrived for almost a century. Despite starting small, the Miller family’s livelihood has grown tremendously, and we couldn’t be happier with the products they’ve unveiled. 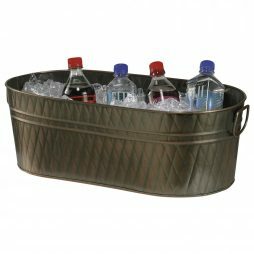 Our Howard Miller collection is sure to amaze any customer browsing through our webpage. So take a look, and just try to take your eyes off of these stunning, artistic timepieces ready to be displayed in any fashionable household. It’s hard not to be awed when the company line alone makes such an impression. These ideals were what 21-year-old Howard C. Miller stood behind when founding his company in 1926. Despite his young age, Howard Miller was determined to prove his worth as a businessman, wanting to create products for both quality and value. 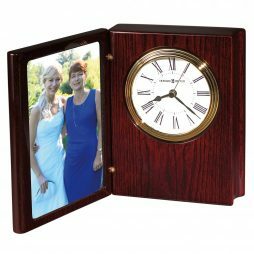 Coming from a background in clockmaking, he would not settle for anything less than perfection from his brand. 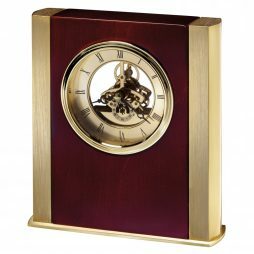 Miller was first introduced to the world of clockmaking through his father, Herman Miller, when they resided in Black Forest, Germany. 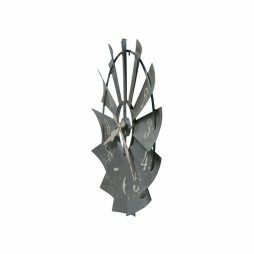 Stemming from an excellent teacher and a creative mindset, Miller developed a keen eye for the art of making beautiful timepieces. This talent and drive for perfection would lead to the success of the family business through three generations (and counting). 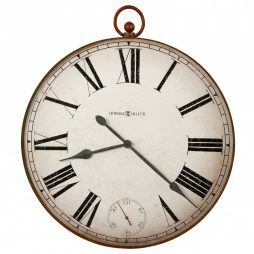 Miller’s earliest creations were centered on the production of chiming wall clocks and mantel clocks. 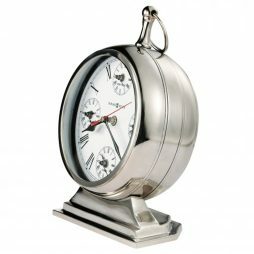 He even went so far as to create some avant garde timekeepers for the sake of artistic freedom. 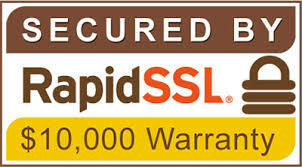 Many of these can be found in collectors’ galleries to this day. 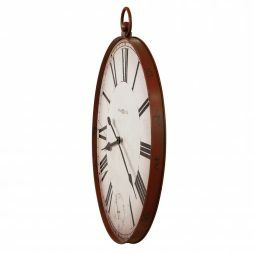 Whether you want a timeless heirloom, like a Howard Miller grandfather or floor Clock, or something elegant and functional such as a Howard Miller wall clock, you’re bound to find something lovely to match the current decor throughout your home. 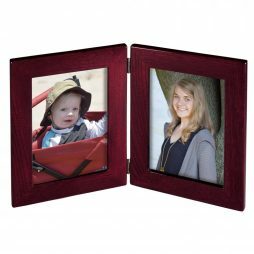 Want to start a family tradition, ready to pass down through younger generations? 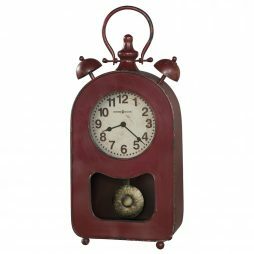 Invest in a dazzling Howard Miller grandfather clock or floor clock that your family will absolutely adore. 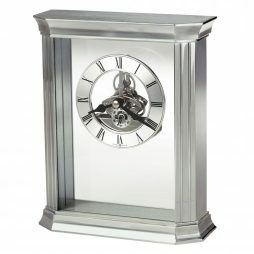 You won’t find anything classier or more traditional than the Avalon Grandfather Clock. 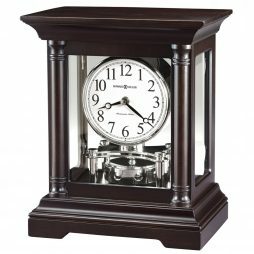 Fashioned in a dark espresso hardwood finish, the streamlined look of this Howard Miller grandfather clock is simple yet stately. 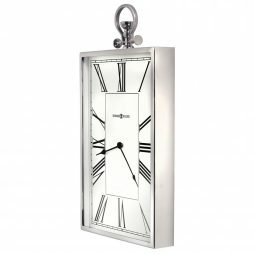 The chrome-finished weights and pendulum can make this fabulous piece a great modern decor choice as well, leaving you with multiple options for your decorating needs. 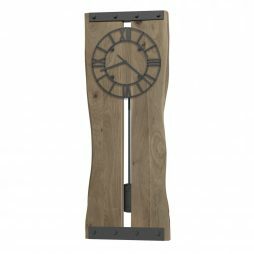 Or are you searching for something a bit more authentic looking, such as the Warren Mechanical Grandfather Clock? 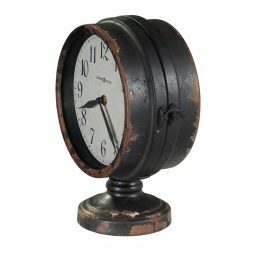 This lovely timekeeper gives off an air of sophistication and old-European style, perfect for a home study or sitting room. The mirrored back panel gives more life to its interior mechanisms, and the decorative swan-neck pediments and shell overlay make this piece a sight to behold. 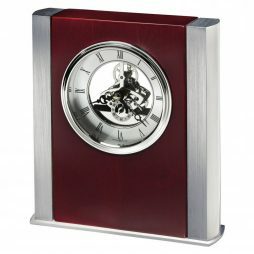 Get ready to amp up the artistic flair with the Tennille Mechanical Floor Clock. 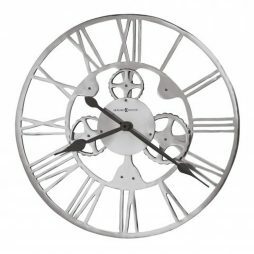 The striking detail in the swirling metal framework alone is unlike anything you’ve seen before. 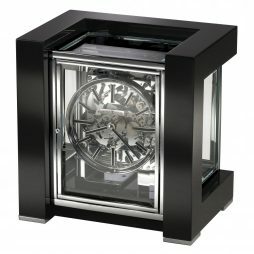 The off-white, large clock dial rests atop this elaborate design, and can be manually set through its protective glass door. 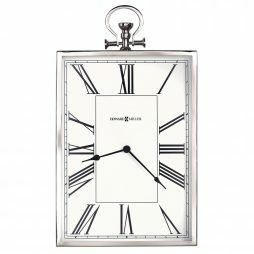 And with the beautiful pendulum hanging inside the artistic frame, this piece is sure to draw attention from any and all guests you invite into your home. 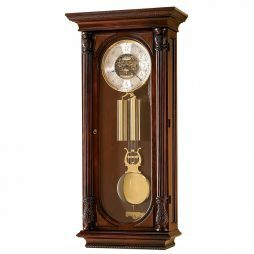 ClockShops.com offers such a wide variety of Howard Miller grandfather clocks and floor clocks, it won’t be easy to choose just one. 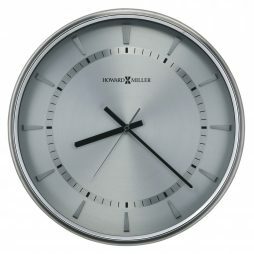 Give your living space a facelift with one of our stylish Howard Miller wall clocks! 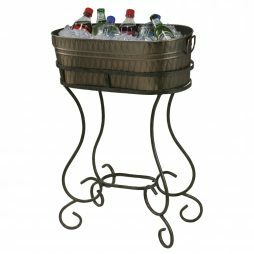 Need something spectacular and modern to wow your friends? 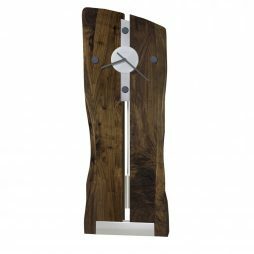 Feast your eyes on the Ceara Oversized Howard Miller Wall Clock. 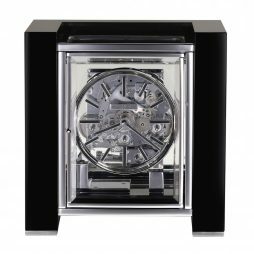 Fashioned with a high-gloss black interior on the dial and shining chrome finishes, this timepiece is an essential accessory for the contemporary set. And the inset mirrored panels offer a special treat, as they will reflect some of the other furnishings in whichever room you choose to place it in. 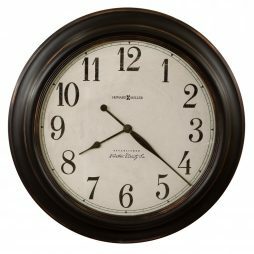 So pick a highly-lit or bedazzled area to fit your new favorite wall clock, and watch as the light refracts back and makes the whole room sparkle! 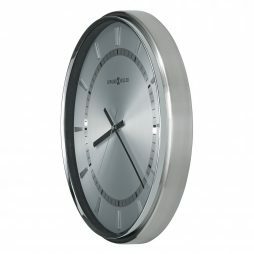 Or perhaps you’re looking for a more simple design to spruce up a minimalist space? 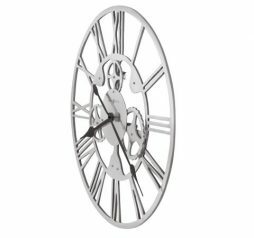 Try out the St. Clair Mechanical Wall Clock, equipped with nothing but a wrought iron frame and charcoal gray and silver finishes. 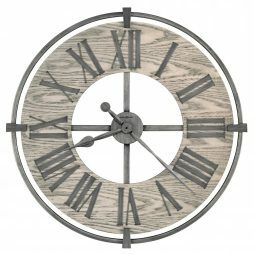 The distressed, marine blue Roman numerals and diamond tipped hour hands add a hint of clever style, but this beautifully uncomplicated design is just the right amount of chic and natural. 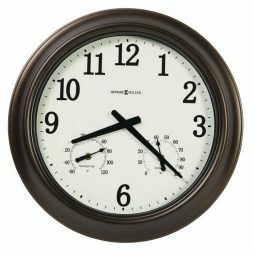 So let your home enjoy a nice makeover without being over-the-top with a modern Howard Miller wall clock to fill in that empty wall space. Expressions of Time only deals in flawless timepieces. 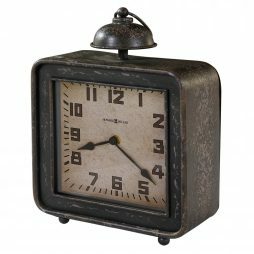 And you can’t ask for more perfection than you get from a one-of-a-kind Howard Miller clock! 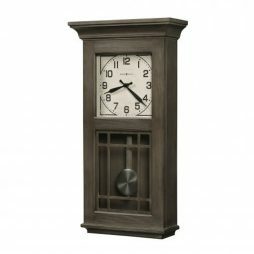 Bring home a Howard Miller grandfather clock steeped in luxury and effortless charm. 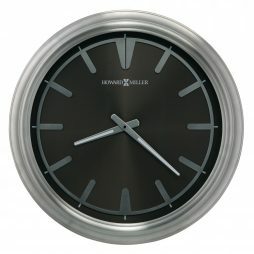 Or treat your favorite room to a Howard Miller wall clock that can serve as both a work of art and a useful accessory to have in the home. The legacy of the Miller name has carried on for almost a century for a reason. 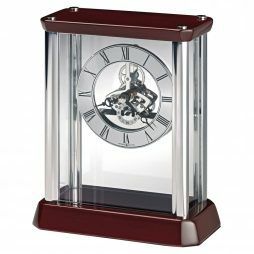 And their pristine timepieces showcase the experience and expertise of the Howard Miller brand, which Expressions of Time is only happy to offer to our customers!